With the promotion of Author Plus I did a fair bit of blogger outreach. I’ll be honest, I’m used to being outreached to, rather than doing the outreach myself. After spending a night looking through blogs using Google Searches and my own network for blogs, I was getting nowhere. Instead I tried something a little more structured, fired up Microsoft Excel, and created a Blogger Outreach Spreadsheet. This spreadsheet I am sharing for you. The spreadsheet is how I use to track bloggers I have outreached to. I can fill in their details (which I’ve removed from this spreadsheet for privacy reasons – kinda don’t want to post other people’s email addresses on there! ), chase up reviews, and also optimise my outreach strategy for future products based on how successful the outreach was. That is how to use it going forward. However, to begin with, I’ve pre-loaded more than 25 WordPress Blogs and sites that either I have had my products reviewed on, or friends have. What Tools Did I Use For Blogger Outreach? Of course this list was constructed a little more constructively than my standard Google Search. To use this for any niche, here are the tools I used. Tweets 2 CSV to find regular tweeters of WordPress news. My Blog Guest – Not as useful as some, but I did use it. Where To Download This List? To download the spreadsheet, click on the button below. That’s it. No signup, and no catch. Though links/likes/tweets to this post would be most welcome! 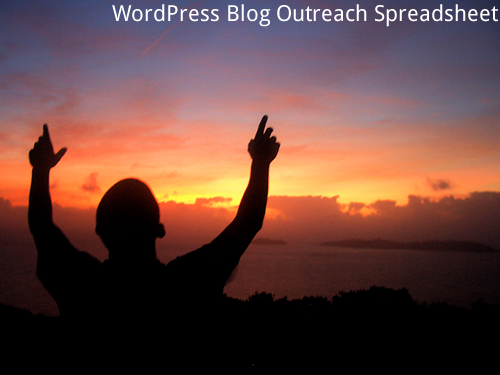 My strategy for link building using blogger outreach is this. I start at the top, and then every week I contact 3 more individiuals. At the time of writing (26th April 2012), I have passed through the entire list and either got a response or seen other people get a response. I use Remember The Milk to schedule the outreach (usually every Monday), and the whole emailing process takes about 45 minutes tops. I Want To Include My Blog On This List! I will be removing dead blogs as I am actually using this tool, so I will update this spreadsheet going forward. If you want to be included in later versions, please contact me. To get updates to this spreadsheet, the best way is to subscribe to my email newsletter. That way I can update you whenever I make changes to this post. It’s free, and you can unsubscribe anytime.